Who was the Jesuit priest mentioned during the Royal Wedding sermon? Dressed in traditional Anglican vestments and preaching in the Gothic beauty of St. George’s chapel at Windsor Castle, Bishop Michael Bruce Curry delivered a sermon for the wedding of England’s Prince Harry and Meghan Markle that was surprisingly nontraditional. Bishop Curry—who is the first African-American presiding bishop of the Episcopal Church, which has at times been in tension with the worldwide Anglican Communion—already made news by being the first American to preach at a royal wedding. Yet Catholics tuning in to the royal wedding were also surprised and delighted to hear Bishop Curry talk about another groundbreaking figure, Jesuit philosopher and scientist Pierre Teilhard de Chardin. “If humanity ever captures the energy of love, it will be the second time in history that we have discovered fire,” he later added. Catholics following the Royal Wedding took to Twitter to express their surprise at the Jesuit priest’s remarks being quoted in an Anglican wedding. 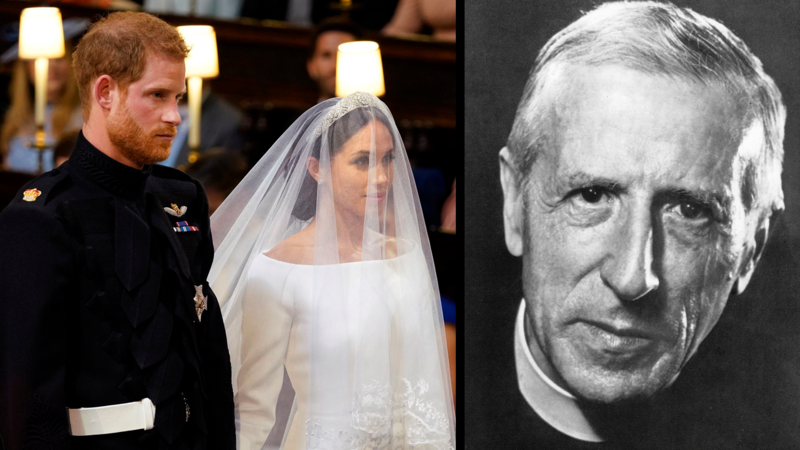 Shout out to Catholic Jesuit Priest Teilhard de Chardin, SJ, at #RoyalWedding . I never, ever thought we'd hear Pierre Teilhard de Chardin preached at @RoyalWedding Just wow. Who was this priest whom Bishop Curry called “scientist, a scholar, a mystic”? At the time of his death in 1955, Teilhard “was widely recognized in U.S. scientific circles for his work on the geology of Asia and his studies of Peking Man. Otherwise, he was virtually unknown,” Thomas M. King wrote in America in 2005. A theologian and paleontologist, Teilhard advanced a new kind of thinking, arguing that “Christ was progressively uniting all thing to become the one in whom ‘all things hold together,’” according to King. Yet his writings were controversial for blending scientific language around evolution with Catholic spirituality, and called for Christians to work in the secular world for Christ could be found there. His writings were controversial for blending scientific language around evolution with Catholic spirituality. Teilhard’s writing has also drawn renewed scrutiny recently from scholars who argue that his evolutionary theology has roots in eugenicist ideology and that his legacy should therefore be reassessed. Will Pope Francis remove the Vatican’s ‘warning’ from Teilhard de Chardin’s writings? In November, participants in a plenary council for the Pontifical Council for Culture formally asked Pope Francis to remove a “monitum” that was placed on Teilhard’s works in 1962. The official warning against his works no longer holds weight, the participants argued, because “his prophetic vision has been and is inspiring theologians and scientists” and his work has been explicitly cited by four popes. Bishop Curry (who leads the declining Episcopalian Church - 1.7M members or 0.52% US population in 2017, about half the number of US Muslims) was being very ecumenical in mentioning Fr. Chardin. He was very enthusiastic and I could see some mildly bewildered looks among the royals. Still, he was very well received. He used "love" 68 times (according to the transcript), or about once every 22 words. He also used the word King, but it wasn't a British one - but MLK. I found Bishop Welby impressive in his delivery and loved the direct language. I wish Harry and Meghan well. They seem like a lovely couple. This generation of royals seem very genuine people, and have found particularly lovely wives. To me, the mention of Teilhard de Chardin was evocative of a future, harmonious, integrated or interconnected society, i.e. a beautiful world vision. This is a great hope and perhaps a prayer for the royals and for leaders everywhere who often seem disconnected from people at the margins whom they lead. Angelo Jesus Canta is a Joseph A. O'Hare, S.J., Postgraduate Fellow at America.